Sanctuary in Messenger of Peace circa 1902, courtesy of the Adair County Historical Society, Kirksville, MO. During its 50 years of service to the Baptist Publication Society, the Railroad YMCA, and later also to the Baptist Home Mission Society, Messenger of Peace had at least nine permanent pastors. It was a challenging assignment: far from home, living in cramped quarters, and expected to operate in an economical manner. For the colporters, at least initially, the chapel car was actually a big improvement in living conditions. Instead of arriving in a town on a bicycle and having to rely on the charity of local residents, the chapel car provided a compact version of the comforts of home. It revolutionized evangelism as it was known allowing a colporter to arrive in a town with everything he needed to conduct his missionary work including a fully functional church. The car had a sanctuary equipped with a lectern, pump organ, and Victrola. It also had living quarters for the pastor and his wife: an upper and lower berth for sleeping, a roll top desk and bookcase, storage lockers, a small kitchen with coal stove, and a single restroom with sink. The car was heated with a Baker heater, a baseboard hotwater heating device that worked well with the right grade of coal, but hardly at all with the wrong grade. The kitchen stove was important for cooking meals, but also for supplemental heating. It had a small range that included an oven and in 1922 nearly destroyed the car! The car featured a watercloset with memorable qualities. At least two pastor's wives complained about it, especially the location next to the kitchen. In later years, a new restroom was constructed on the rear platform in a new enclosure. Chapel car brochure, 1899, page 2. Northwest Railway Museum Collection. 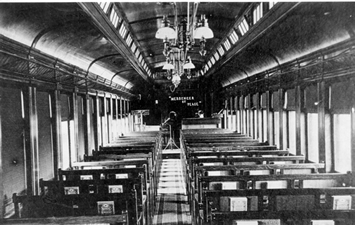 Pastors assigned to the chapel car were required to mail weekly reports to the Publication Society summarizing the work they performed. Additional analysis of this brochure was conducted and posted on the Northwest Railway Museum Blog. While visiting eastern Washington, corrosion in the back of the stove allowed a fire in the stove to escape. A few sparks got out and set the bulkhead wall on fire. It was not yet fully evident that the car was on fire and only when the pastor was in the water closet (toilet in today's language) next door did he discover the fire. He quickly extinguished the fire and saved the car. Unfortunately the chapel car was damaged by the fire, but most of the impact was confined to the wall between the kitchen and water closet. In the summer time, the Messenger of Peace could heat up to unbearable temperatures. It came equipped with awnings that could be placed along the side of the car by day to help shield it from the sun. It is also equipped with clerestory windows that greatly aided in the car's ventilation. In the winter time, the Messenger of Peace was difficult to heat. A variety of issues afflicted Baker-type heaters and if the heating ever failed in cold weather, the pipes would freeze and burst. Chapel car brochure, 1899, page 4. Northwest Railway Museum Collection. 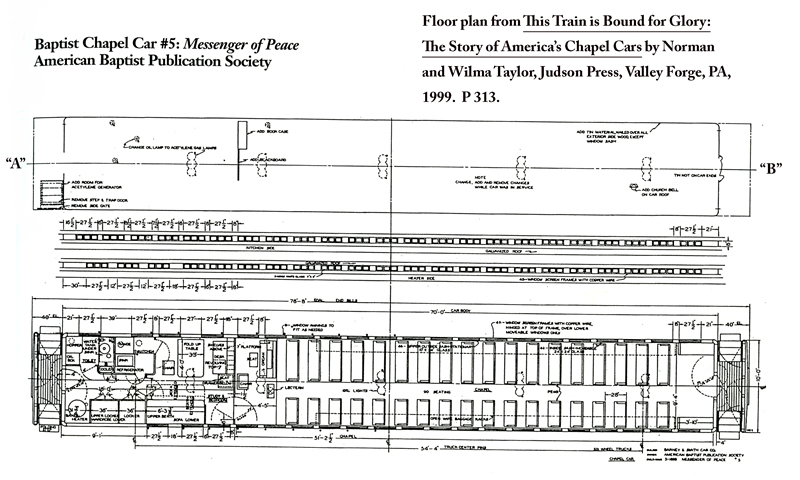 Chapel car 5 Messenger of Peace floor plan. Officially, there was seating for 90 in a 3 & 2 configuration, but it would have been very cramped. Drawing reproduced courtesy of Wilma Taylor.